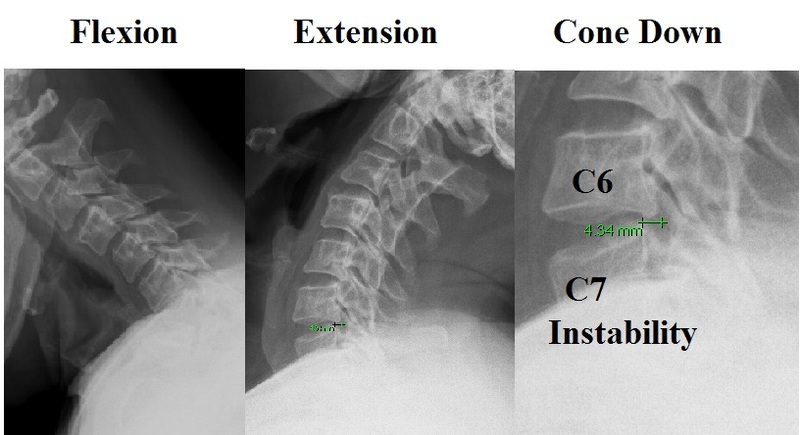 In this x-ray series, it demonstrates movement of the vertebral body of C6 on C7. On Flexion, the posterior corners of the vertebral bodies line up. But, with extension, there is a 4.3 mm movement of the C6 body posterior (towards the back) to the C7 body. The accepted criterion for cervical instability includes a motion of greater than 3.5 mm’s. 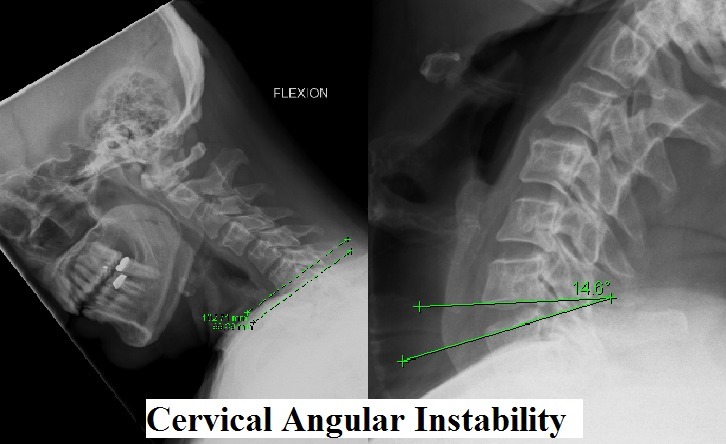 In these same X-rays, we identify another known criterion for cervical instability. On comparison flexion-extension x-rays, instability can manifest by excessive “fishmouthing” of the disk space. In the above images, we can see that when the neck extends, the disk space opens. When the disk space angles are measured, it opens to 14.6 degrees. When the neck bends forward or is in flexion, the end plates are essentially parallel. Instability is established by a angulation of greater than 11.5 degrees on comparison flexion-extension. So, the question becomes, when should we suspect a cervical instability? First, lets assume these people have already been worked up to make sure there is no fracture, tumor, infection or significant disk herniation. Then, let’s assume these people have already had the usual initial treatments such as physical therapy, chiropractic care, and medications. 1. In patients with chronic neck pain, who describe increasing pains with specific motions, flexion-extension x-rays can help define the instability. As a side issue, I am sure there a some patients that become instable with rotation as well. Unfortunately, we do not have good established criterion on how to define a rotational instability, and we do not have a good test, that does not subject you to significant radiation dosing. In theory, we can have baseline CT scans of the neck, then as the person to rotate the neck to see if there is excessive facet subluxation on rotation identified by the CT scan. But, now that we know there is a certain radiation risk to CT scans, I do not know if the risks for the scan will justify the test for rotational instability. And, as discussed above, criterion for rotatory instability has not been established. 2. Patients who have had a recent trauma, with concerns of disruption of the liagments and supporting structures in the neck. 3. People with Rheumatoid arthritis have risks of developing instability secondary to the auto immune effects. Continued neck pain should be evaluated for instability. There is a problem, however with flexion-extension x-rays. Sometimes, people have severe neck stiffness and pain, with spasms. In that scenario, people will not allow the neck to flex or extend. We cannot get enough information to assess instability. To this point, often times, during an operation, when people are relaxed due to the anesthesia, we often identify a instability pattern by direct observation of the disk level, or by obtaining imaging during the operation. Cervical Instability is a potential serious issue, and can lead to significant problems. Minor instabilities can be treated with exercise and therapy. But, significant instability usually require surgical management.